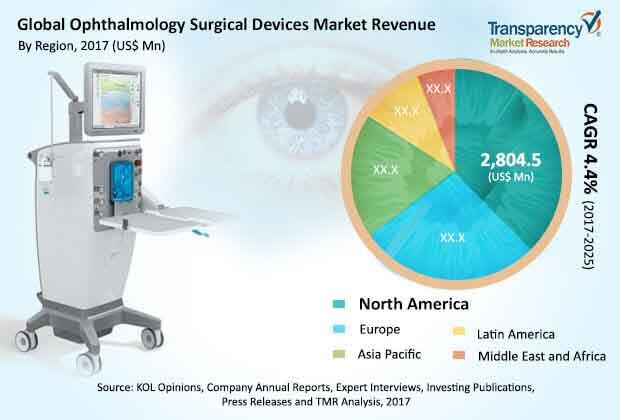 The demand within the global market for ophthalmology surgical devices has been rising on account of the rising incidence of eye diseases and disorders, finds Transparency Market Research (TMR). The competition in the global ophthalmology surgical devices market has been rising as new vendors make way into the market. Furthermore, the market for ophthalmology surgical devices is expected to undergo successive fragmentation in the forthcoming years. This is because the total market share is disparately divided amongst the various small, medium, and large-scale vendors. There is a high possibility that the leading vendors in the global ophthalmology surgical devices market would witness fundamental changes in the years to come. The leading vendors in the global ophthalmology surgical devices market are projected to merge with the smaller vendors. Furthermore, these vendors are also prognosticated to introduce their ancillary units in order to capture the local markets. The small and medium-sized vendors in the global ophthalmology surgical devices market are focusing on decoding the growth strategy of the larger players. Moreover, the smaller vendors are also expected to form coalesce and alliances amongst themselves. The key vendors in the global ophthalmology surgical devices market are Glaukos Corporation, IRIDEX Corporation, HOYA Corporation, and Johnson & Johnson Vision Care, Inc.
Transparency Market Research (TMR) finds that the global ophthalmology surgical devices market would expand at a steady CAGR of 4.0% over the period between 2017 and 2025. Furthermore, the market for ophthalmology surgical devices is expected to accumulate revenues worth US$ 11.0 Bn by 2025, rising from a value of US$ 7.0 Bn in 2016. On the basis of product, the demand for cataract surgery devices has been rising at a robust pace. Based on geography, the market for ophthalmology surgical devices in Asia Pacific shall grow at a starry pace. The presence of a matured domain of ophthalmology is behind the growth of the global ophthalmology surgical devices market. Diseases and disorders related to the retina have been on a rise, and this factor has also played a crucial role in the growth of the global ophthalmology surgical devices market. Furthermore, cataract surgeries are being performed across regional clinics and small healthcare centers. This has in turn driven demand for ophthalmology surgical devices in local areas and territories. Hence, there is little contention about a stellar pace of growth within the global ophthalmology surgical devices market. It is evident that the boisterous pace of urbanization has led to the opening new clinical and surgical centers across the suburbs and cities. However, the most stellar driver of demand within the global ophthalmology surgical devices market is the commencement of surgical centers in rural areas. On the flip side, the absence of medical reimbursement for ophthalmic treatments could be a threat to market growth. Nevertheless, governments across several regions provide incentives for the development of dedicated ophthalmic clinics. This factor shall continue to aid the growth of the global ophthalmology surgical devices market in the years to come. The review is based on TMR’s report titled, “Ophthalmology Surgical Devices Market (Product - Cataract Surgery Devices (Intraocular Lenses (IOLs), Ophthalmic Viscoelastic Devices), Glaucoma Surgery Devices, Vitreoretinal Surgery Devices, Refractive Surgery Devices; End use - Hospitals, Ambulatory Surgical Centers, Ophthalmic Clinics) - Global Industry Analysis, Size, Share, Growth, Trends, and Forecast 2017 – 2025”.